Jose Reyes, founder of NuScale Power and OSU professor emeritus has been elected to the National Acadmey of Engineers. Jose Reyes, professor emeritus of nuclear engineering at Oregon State University and founder of NuScale Power located in Tigard, has been elected to the National Academy of Engineers. Reyes, on the faculty of OSU's College of Engineering for 30 years, was one of 99 new members elected this year, each one of the world's most accomplished engineers. "It is extremely gratifying to see my innovative research, born at Oregon State University, mature into this cutting-edge NuScale Power technology now poised to change the world," Reyes said. "The greatest validation of an engineer's innovations is to see it put into practice for the benefit of people and the planet. I am greatly honored to be elected to the National Academy of Engineering and look forward to contributing to its mission." 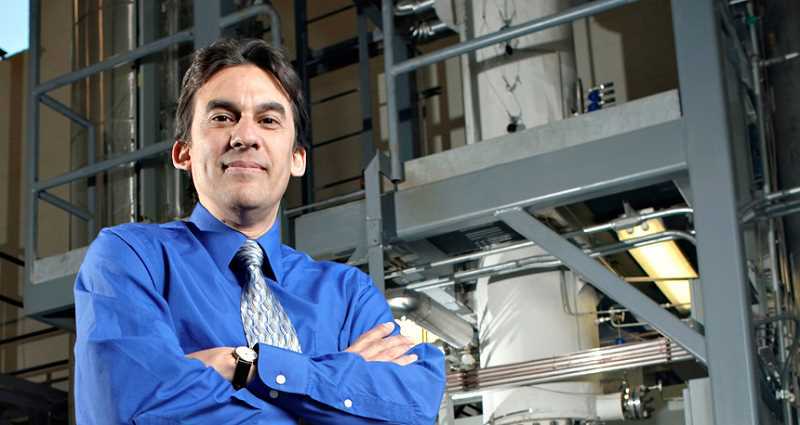 Reyes, who retired in December 2017, ran OSU's nuclear engineering program from 2005 to 2010 and directed the Advanced Thermal Hydraulic Research Laboratory at Oregon State. He held the title of Henry W. and Janice J. Schuette Endowed Chair in Nuclear Engineering & Radiation Healthy Physics, founded NuScale Power while at OSU and serves as the company's chief technology officer. The National Academy of Engineering, founded in 1964, operates under the 154-year congressional act of incorporation signed by Abraham Lincoln that established the National Academy of Sciences. The NAS is now known as the National Academies of Sciences, Engineering and Medicine. The NAS has 2,555 peer-elected members, all senior professionals in business, academia and government, who provide leadership regarding how engineering, technology and quality of life relate to one another. Academy membership honors those who have made outstanding contributions to "engineering research, practice or education" and to "the pioneering of new and developing fields of technology." Reyes will be formally inducted Sept. 30 during a ceremony at the NAE's annual meeting in Washington, D.C.
About the OSU College of Engineering: The OSU College of Engineering is among the nation's largest and most productive engineering programs. Since 1999, the college has increased its research expenditures to $55.6 million by emphasizing highly collaborative research and innovation that solve global problems. It's a leader in signature research areas, including precision health, clean energy, resilient infrastructure and advanced manufacturing; and targeted strategic areas, including robotics, materials research and clean water.